Rosa Cintrón is Associate Professor in the Department of Educational Research, Leadership, and Technology at University of Central Florida, Orlando. She received her Ph.D. in Educational Leadership from the Florida State University. Erin Taylor Weathers is a coordinator of academic affairs projects with the Oklahoma State Regents for Higher Education, and a guest lecturer in adult higher education at the University of Oklahoma. She received her Ph.D. in the Department of Educational Leadership and Policy Studies, Adult and Higher Education Program from the University of Oklahoma. Katherine Garlough is a grant writer for International Development for Enterprise and Autonomy (IDEA). She received her Ph.D. in Adult and Higher Education from the University of Oklahoma. This book was very interesting and informative....It is more suited for high-level administrators and campus counseling centers. College Student Death would be a great resource for college campus administration as well as institutions in the beginning stages of preparing or re-organzing a campus response team. 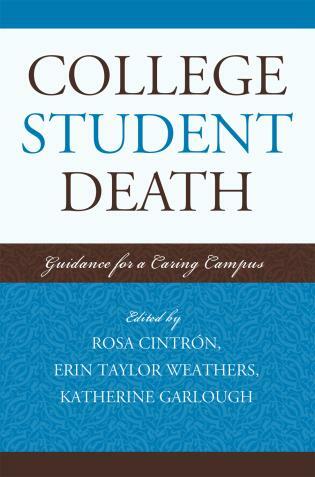 College student death affects the depth and breadth of the campus community. Members of innumerable campus units—including student affairs, housing, counseling centers, police departments, international programs, student life, legal affairs, administrative affairs, drug and alcohol centers, health centers, religious communities, and athletic departments—can benefit from this book.